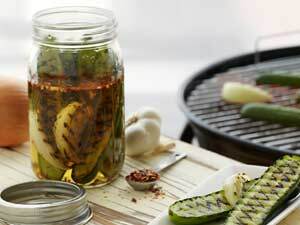 Use any variety of kosher, dill, or garlic pickles. Do not use sweet pickles. Drain the pickles and reserve the brine. Cut the pickles in half if they are not already. Pat them dry. In a large bowl mix the pickles, onions and olive oil together. Grill 4-5 minutes turning once over medium high heat. Add them back to the brine and serve or keep refrigerated for 3-4 days. This entry was posted in Modified Profast (Fast and Flexible) Recipes, Nutriplus Recipes (Balance Your Pyramid), Party & Entertaining, Tips, Uncategorized, Vegetables and tagged appetizer, Brine, easy, garlic pickles, healthy, onion, Pickled cucumber, pickles, side dish, snack, Vegetable, vegetarian by foodies4mmc. Bookmark the permalink.